This creeping member of the rose family spreads by means of runners that root at leaf nodes. Its leaves are often silver on upper and lower surfaces early in theyear, and the underside of the leaves often remains silver through the summer too. Potentilla anserina is a creeping perennial rarely much taller than 10cm. The flexible stems run along the ground, and when they contact disturbed soil they root at nodes. Flowers, which are solitary in leaf axils, are bright yellow, 2 to 3cm across with five overlapping petals backed by a smaller five-lobed calyx. Each flower has 20 stamens and even more pistils, and the flowers are borne solitarily in leaf axils. The stalked pinnate leaves of Silverweed are alternate and usually have 7 to 12 pairs of toothed leaflets plus a terminal leaflet, and on the underside and sometimes also on top they are covered in very fine white hairs..
Silverweed is common and widespread in Britain and Ireland and in many northern and central European countries including Slovenia, where we saw a lot of it growing in the Triglav National Park. 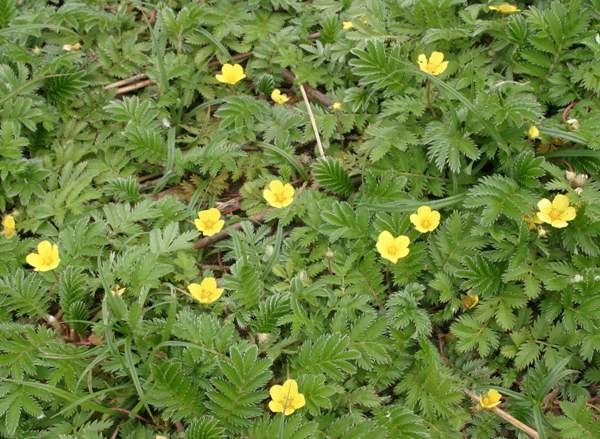 Silverweed loves damp heavy soil, and is often seen on cliff walks andbeside country lanes. The flowers first appear in May, and Silverweedcan sometimes be found in bloom as late as September. Old herbal remedies included Silverweed root extracts for treating epilepsy and for various gastric disorders including diarrhoea. Its leaves used to be put in to shoes to absorb sweat. The specific epithet anserina means of or pertaining geese; that suggests that these kinds of birds are particularly fond of Silverweed, but to date we haven't noticed it. 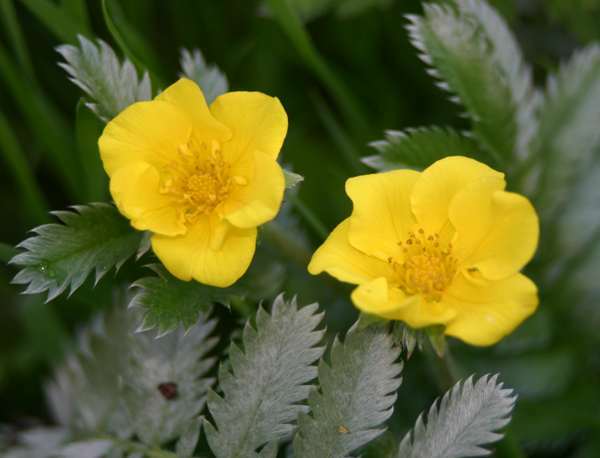 Tormentil Potentilla erecta, often found on cliff tops as well asin hedgerows and on moorland, is similar to Silverweed but its flowers have four petals and its pinnate leaves are palmate. Creeping Cinquefoil Potentilla reptans is similar but its leaves are palmate. 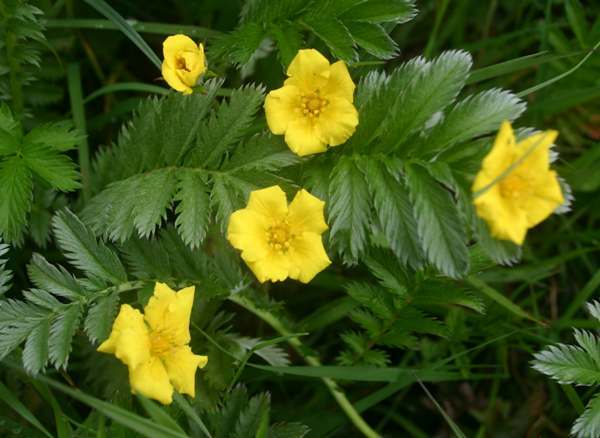 The pictures of Silverweed shown on this page were taken in West Wales during June.